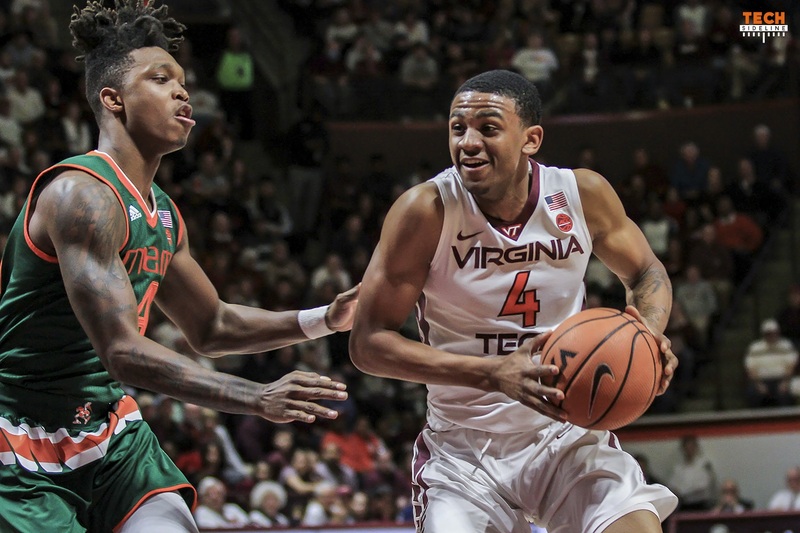 Virginia Tech had yet another disappointing home loss, this time falling to Miami 84-75 in Cassell Coliseum on ESPN on Saturday afternoon. The Hokies dropped to 16-7 overall and 5-5 in the ACC. Miami improved to 17-5 overall, and 6-4 in conference play. Two weeks ago, Virginia Tech did not give maximum effort in a home loss to Florida State. With their backs against the wall, the Hokies came back out to defeat UNC two days later, and then went on to win road games at Notre Dame and Boston College. However, the team was back to their Florida State form against Miami, and it is frustrating head coach Buzz Williams. Following the game, Williams noted specifically that his team’s energy level isn’t where he needs it to be. After jumping out to a quick 7-2 lead, Virginia Tech fell behind by as many as 16 points in the first half. Their issues came mostly on the defensive end, where they struggled to stop the ball and allowed far too many good Miami looks around the basket. Later in the first half, Williams pulled some of his regulars, and instead opted to play freshmen such as Wabissa Bede and PJ Horne. Those players gave the Hokies a spark, and they performed better on the defensive end. Horne had eight points and seven rebounds as Kerry Blackshear’s replacement. Blackshear had just two points and one rebound in 15 minutes. He was not benched for foul trouble, but because of his effort. Blackshear wasn’t the only Hokie to draw Williams’ ire. “No moxy, no toughness defensively,” Williams said of his team on his postgame radio show. The performance was particularly disappointing considering the Hokies had won three games in a row, and a great crowd showed up in Cassell Coliseum ready to make a lot of noise. However, they didn’t have much to cheer about until the second half. At halftime, the Hurricanes led 44-32 despite the best efforts of backups such as Bede and Horne. Once the Hokies focused in, they rallied and nearly came back. They threatened Miami late in the game, when a personal 6-0 run by Justin Bibbs made the score 66-61 with 4:25 remaining. On Miami’s next possession, Justin Robinson got a steal midcourt and went the distance for a dunk, making the score 66-63 with 3:51 remaining. At that point the Hokies had the momentum, and it appeared they had a great chance to capitalize and win the game. It wasn’t to be. Miami made shots on three of their next four possessions, and that 3-point margin was as close as the Hokies got. The Hurricanes made their free throws down the stretch to close out the game, and Tech could only look back at their poor first half performance in frustration. Virginia Tech played very good defense for the majority of the second half, which allowed them to get back into the game. Miami shot just 42.9% from the field over the final 20 minutes after shooting 58.6% in the first half. The Hurricanes also had more turnovers (13) than assists (9). Still, the Hokies lost because they couldn’t stop the ball in the first half. Williams’ comments following the game show that he feels Tech’s effort was the main reason they struggled defensively. The Hokies will hope to handle failure well yet again when NC State arrives in Blacksburg on Wednesday. Tech will face the Wolfpack in a 9pm game that game will be televised by RSN. Click here for affiliates showing the game. It was announced this morning that next week’s game at Virginia will be ESPN’s College GameDay Game of the Week. The game, shown on ESPN, will tip at 6:15 p.m. at John Paul Jones Arena. Justin Robinson scored 22 points. It is his team-high 17th game in double figures this season and his 10th consecutive. He has scored in double figures in all 10 ACC games this season. It is also his third game of 20-or-more points this season. Justin Bibbs scored 16 points. It is his 15th game in double figures this season. Bibbs passed Les Henson into 22nd place in career scoring at Virginia Tech. He now has 1,339 career points. Nickeil Alexander-Walker scored 15 points. It is his 12th game in double figures this season. P.J. Horne grabbed a career-high seven rebounds. He also played a career-high 23 minutes. The announced crowd was 9,275. This marks Tech’s fifth sellout of the season. I’m glad it was a lack of effort. I thought Buzz had installed a European defensive strategy (I think it’s called the Matador Defense). It didn’t work. Free throw shooting … there’s your ball game! Extremely disappointing effort by the players and, ultimately, the coaching staff. Both FSU and Miami are good teams, but teams we should beat in the Cassell. Our D is dreadful. If CB continues to focus on point guards and 6’5 wings this scenario will keep on playing out. We need skilled 6’8” players with length. I realize we need a couple of point guards on the team but we also need length on the team and both need to be able to shoot and play solid D.
We had 2 guys last season that were leaders on and off the floor and wanted the ball in their hands at crunch time and they were successful more times than not. We don’t have that this year. I hope we can turn this season around for a positive out come, if not NIT here we come! Everyone needs to remember these are kids in college. They are not pros and most of them will not be. That said, they just reeled off 3 ACC wins followed by a dud. It happens. Glad Buzz is on them about the effort. That is the key for this team. 3 duds at home, UVA, FSU and UM. Had to go in OT to beat BC at BC, bereft beat depleted ND at ND. No doubt we’ll take any win any time. I truly want these guys all the success and I rout for them endlessly. I want them to succeed and have fun for themselves and their team. For a scholarship player, a lack of effort is not easy to take, unacceptable. Not sure who is to blame. We all have a bad day from time to time, but unless you are ill or hurt, not playing hard is tough to watch. What if the Hokie donors showed a lack of effort? Best not see too much more of this effort issue. I wish Med & Clarke would stop trying to dribble drive. For the most part, Clarke is fine dribbling in transition and fast breaks but he needs work taking his defender off the dribble in the half court. Also, Clarke is a little too casual for my liking when inbounding the ball and bringing the ball up court. Wish he’d play with a greater sense of pace and urgency because he’s a freak athlete. Med should focus on spot up shooting & crashing the glass for now and put significant emphasis on his ball handling in the offseason. Too often he’s out of control, but I believe he can get better with practice. Glad to see PJ get productive minutes but I agree with the posts that say he needs to work on his FT shooting to earn more minutes. JRob played another great game despite a couple turnovers that he’d probably like to have back. Solid game from Bibbs. Still waiting for a game when the entire team comes out hot. When that happens, we’ll be tough to beat. Question: does Buzz employ a sports psychologist? Or is he the sports psychologist? The team’s issue seems to be more mental than anything else. Buzz needs to recruit some height along with some rim protectors! Additionally we are terrible at defending the 3 point line! Buzz needs to take some notes on defense from Mr. Bennett in C’ville!! Got dat right! !’ Fundamentals are lacking…free throws, blocking out, basic shooting form, getting offensive rebounds, up close tough defense and on and on. Effort totally showed on the defensive end during the first half. Way too many layups. Buzz does need to change to zone when the boys are ALL getting beat off the dribble like they were in the first 10 minutes. That set the tone for the rest of the game, as VT was forced to played tentatively on the offensive end when they got down by 10+ in the last 10 minutes of the first half. If Home wants more minutes his foul shooting must improve. season unfolds from this point. The only thing Buzzie does well is negotiate his contract. This is all on him. One more year maybe. And then your replacement would be????? Come on man. There is always coaching talent out there. A base expectation of your coaching staff is to have your team ready to play every night. Totally unacceptable. Put your big boy pants on. Gut us excited and then rip our hearts out! This stuff happens to most every team (Duke today) but it happens to us too much. I’m not down on Buzz BUT he is right, having the team play hard is the coach’s responsibility. I’m not feeling the home court advantage this year. Three numbers tell the story of the game: 0- number of points Hill scored, 2- number of points Blackshear scored, and 53- the percentage VT shot from the foul line. That team was better than us. Size and were always under control. Disappointing “home loss” for certain. Lack of effort and lack of defense doomed the Hokies today. They just didn’t look “ready to play” from the start and foul shooting was horrible. Just got home from the game after having dinner on the way back. Very long drive to B’burg and a longer drive home. This team needs to win those home games to keep fans coming back. Doubt I return Wed. night for a 9 pm game. If you want to see empty seats, keep putting that kind of effort out there for Saturday home games. We went to the FSU game, first game in many years. We showed up but the team didn’t. Long trips, hotels, – enjoyed the Burg, but the game was disappointing. Glad we had a sell out! Too bad we can’t replay the first half….